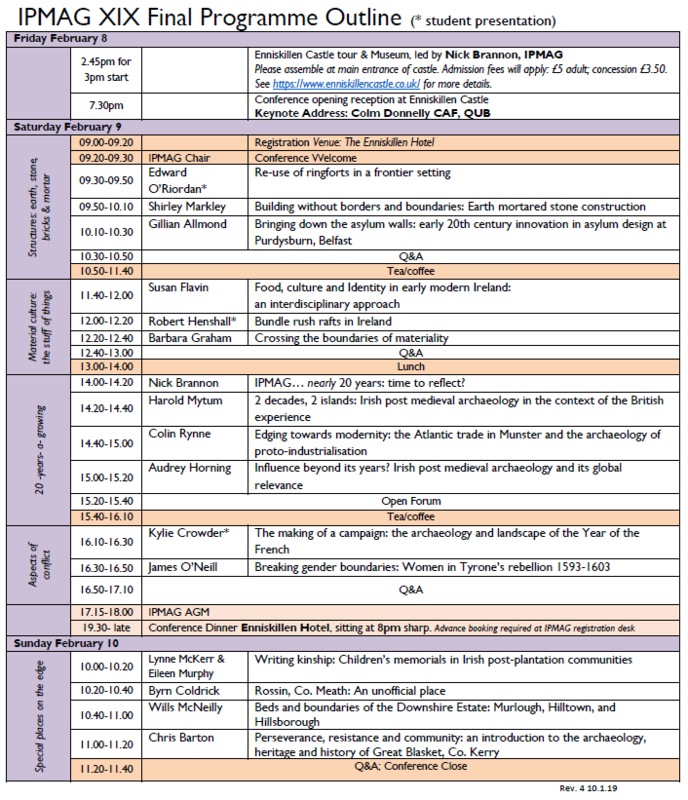 The Irish Post‐Medieval Group (IPMAG) is pleased to announce its annual conference to be held on 8‐10 February 2019. In keeping with our annual alternate location, this year’s conference will take place in Enniskillen Co. Fermanagh. In the current climate Borders and Boundaries are on everyone’s mind. Borders and Boundaries are of particular interest to archaeology as they form interfaces, the ‘coal-face’ where humans, monuments and material culture interact, mingle or come into conflict. Borders and Boundaries can be physical entities in the landscape, lines drawn on maps, or divisions manifested in the minds of people and societies. Moreover, Borders and Boundaries can symbolise vastly different things to different people and groups. With today’s impact of Brexit imminent, and as an unavoidable backdrop, this conference hopes to explore archaeological and historical aspects of Borders and Boundaries from the post-medieval to the present; both actual and more metaphysical. Fees: IPMAG members €30; non-members €55; concession €27.50. IPMAG annual subscription €20. Accommodation: The conference venue offers accommodation and there is a special conference rate on a limited number of double rooms £95; & single rooms £85. See www.enniskillenhotel.com. There is a full range of accommodation in close proximity to the venue also – details here.